(Newser) – We've all been there: Needing to "go really bad," without a toilet in sight. 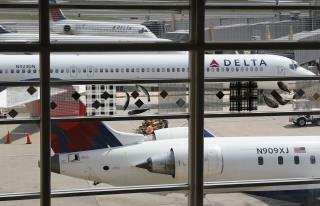 The situation got a little more uncomfortable for passengers on a typically 6-hour Delta flight from New York City to Seattle Saturday night, who were forced to make an unscheduled pit stop—or "potty break," as the Billings Gazette puts it—in Billings, Montana. The Boeing 757 had to divert roughly 200 miles after its toilets stopped working and passengers basically couldn't hold it the rest of the way. They apparently had to go so badly, per a Delta incident report, that when they found no gate available at Billings Logan International Airport the plane taxied to a cargo area. Who me, fly? Not on a bet. If I can't walk, drive, or take a train or a bus, I'm not going. I used to love to fly, and did so often, when it was a civilized endeavor. Now its become an experiment in ritual suffering, to board an aircraft, never mind all the pointless body scans and groping that goes on, beforehand. If you want to pay for the privilege of being abused, be my guest. I've got better things to do. Aren't those air sick bags plastic-lined? United recommends a depends and head gear with a mouth guard just in case.